HandKrafted by Stephanie: Taylored Expression November Blast from Past Hop! Taylored Expression November Blast from Past Hop! 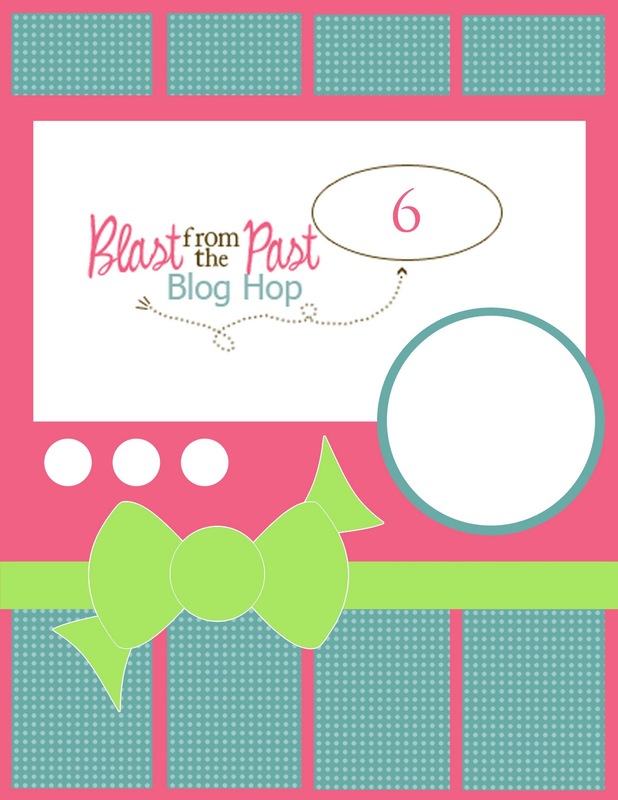 Hello and welcome to the Taylored Expressions November Blast from the Past Blog Hop! Each month, Taylor invites her customers to participate in this fun hop and feature Taylored Expressions Stamps! The theme for our November hop is Autumn/Thankful. If you happened here by chance, please check the full list of participants at the bottom of this post! Before I started, I selected this sweet image of Cuppie from A Year of Sweets 3. Next, I pulled out my October Key Ingredients since it has everything that I needed to create an autumn card. I colored Cuppie with Copic markers. I stamped an extra image, colored a couple of the pumpkins, cut them out and popped them up with foam tape. My sentiment is from Garden Party Critters. 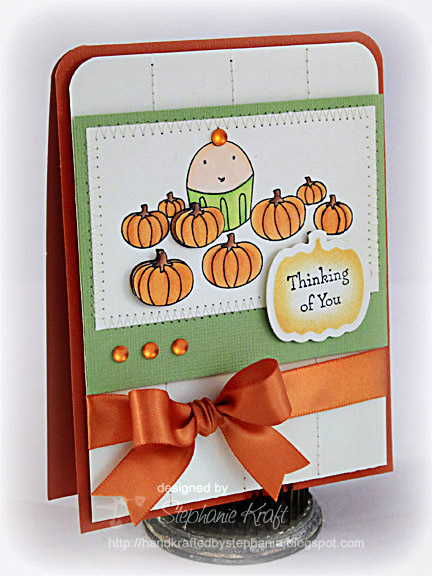 I stamped "Thinking of You", cut it out with Spellbinders Nested Pumpkins and sponged some Wild Honey Distress ink onto it while it was still in the die. For my layout, I used the fabulous (yet optional) sketch by Sankari (below). I tried a few different patterned papers on my background, but I thought they looked too busy, so first I scored a few vertical lines, then as I was putting my card together, I decided to stitch over the score lines. Accessories: Nested Pumpkins (Spellbinders), Round-it-All (Zutter), Markers (Copic), Ribbon (Taylored Expressions October Key Ingredients), Frosted pearls (Pizzazz Aplenty), Foam tape, Thread, Sewing machine. What a darling card, Stephanie! Love the popped up pumpkin! Super cute! Love the popped up pumpkins and the die cut sentiment! You picked the perfect image for this hop! What a cutie, the ribbon really sets it off. Totally cute. Loving those pumpkins for the saying. Very ingenious. Ack! Cuppie is so cute in the middle of that pumpkin patch! LOVE how you popped some of the pumpkins!!! Cute card. Love the stitching and the popped pumpkins. What a great take on the sketch, Stephanie...your little cuppie is adorable and I just love your sewing!!! This is so cute! I love the way you used the white! What could be cuter than Cuppie? Cuppie with pumpkins! Super cute! This is soooo cute! I love the coloring! It's super pretty! 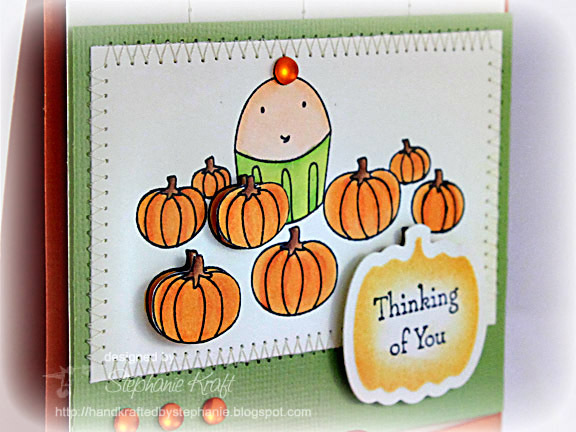 The gems are adorable and I love the pumpkin die cut as well! Stephanie--what an adorable card! Cuppie is so cute, and I just LOVE the sentiment on the pumpkin nestability! This totally makes me smile! LOOOOOOVE that nestie pumpkin and your coloring on Cuppie!!! Adorable images and wonderful coloring. Lovely card!